T here has been a lot of confu- sion over the years as to when to make a marine casualty re- port with regard to certain in- cidents. Yet, although the Coast Guard constantly urges industry to make re- quired reports, it has never promulgated national guidance to promote consis- tency in reporting based on uniform in- terpretation of the regulatory standards – until now. SCG-2013-1047-0002. Comments are due by April 14, 2014. 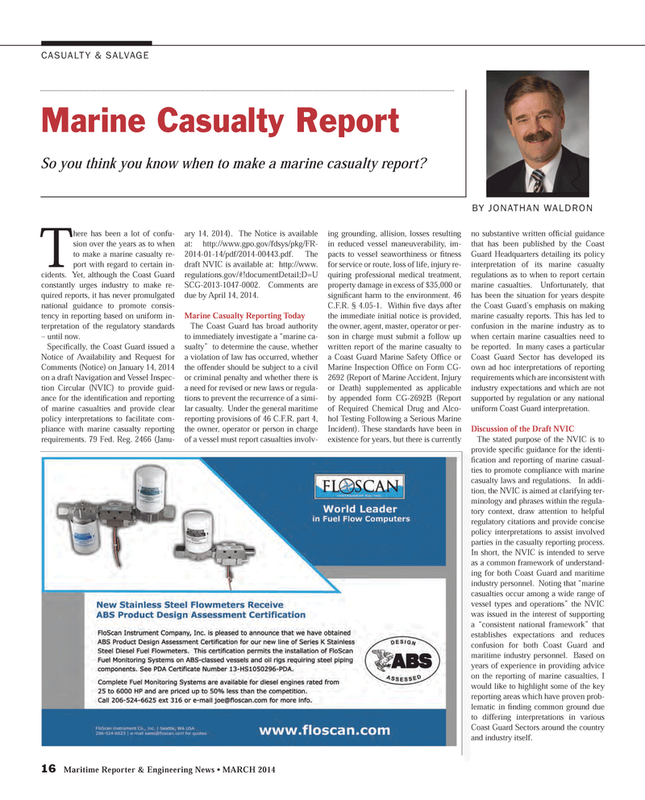 Coast Guard Sector has developed its own ad hoc interpretations of reporting requirements which are inconsistent with industry expectations and which are not supported by regulation or any national uniform Coast Guard interpretation. The stated purpose of the NVIC is to provide specifi c guidance for the identi- fi cation and reporting of marine casual- ties to promote compliance with marine casualty laws and regulations. In addi- tion, the NVIC is aimed at clarifying ter- minology and phrases within the regula- tory context, draw attention to helpful regulatory citations and provide concise policy interpretations to assist involved parties in the casualty reporting process. Coast Guard Sectors around the country and industry itself.